Comets may have dispersed the seeds of life throughout the galaxy. Panspermia, seeds of life being dispersed through the cosmos by rogue comets. There’s a theory that life came from the stars. It’s a beautiful idea, especially if you’re a stargazer like me. The term has been around since the Greeks (Anaxagoras, 5th Century BC) and has been used with increasing scientific rigor into modern times. The idea assumes that life evolved at least once, but does not address how. Panspermia is a concept about how life is disseminated through the Universe. Planets are messy, leaky things, especially when they get hit by space debris or simply collide with another large celestial body. When this happens, the stuff of rudimentary life: bacterial cells, recombinant proteins, etc, are dispersed into space. Sometimes this takes the form of dust, sometimes frozen into comets. 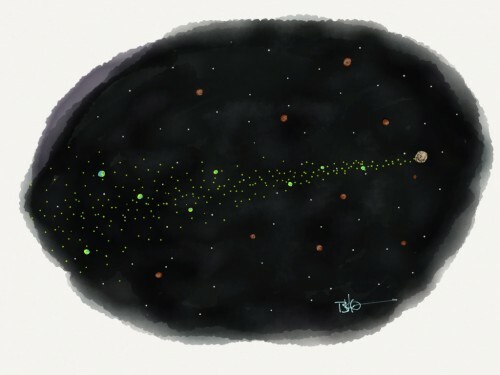 As comets meander solar systems, often crossing the paths of planets, they leave a trail of debris, which can enter the atmosphere, bringing with it any life that might happen to have been on board. What could possibly survive that? Lots of things, as it happens. Particularly the abundant endospores of single celled life. Of the many things that I love about this idea, from a not-very-scientific part of my psyche, are that it presents the possibilities that life is everywhere, life will always be a part of the fibre of the Universe, and that all life may possibly be connected, even that of distant worlds.